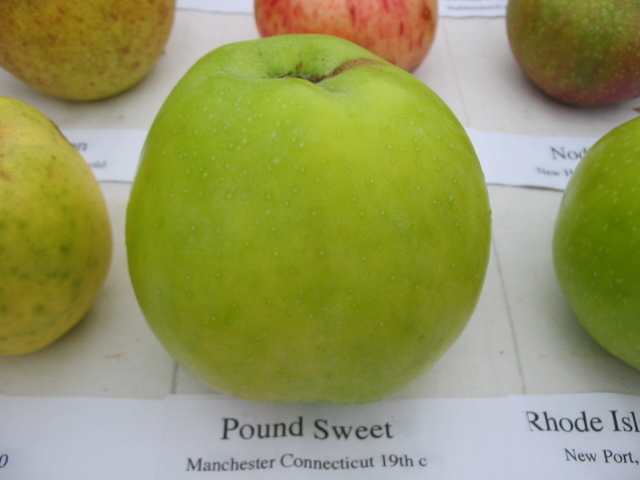 Pound Sweet originated in Manchester, CT about 1834. This famous cooking apple was once widely planted on Maine farms and can still be found here and there. There are several old trees within a couple miles of our farm in Palermo. This apple is called "Pumpkin Sweet" in Beach's The Apples of New York and elsewhere throughout New York and New England. We believe that the name was changed to Pound Sweet here in Maine because there were already several apples named "Pumpkin Sweet" grown in Maine. The flesh of the apple is firm, rather coarse and tinged with yellow. Beach called the sweet flavor “peculiar”. Pound Sweet is often claimed to be the best fall variety for baking, for applesauce and even for stewing with quince. The apples take awhile to cook into sauce and require quite a bit of water, but they need no sugar and get sweeter as they cook. To roast, just put the whole apple on a baking sheet and cook in the oven until the skin is wrinkled and the flesh is soft to the touch. Then peel back the skin and eat with a spoon. Sweet enough to be eaten on its own or add some cream or ice cream for a fancier dessert. It is good comfort food when you are feeling under the weather. Pound Sweet is not a pie apple and not recommended for fresh eating. It will keep for a few weeks after picking.